Bonnie A. McKeegan, LCSW is a private practice psychotherapist providing mental health treatment to adults, who also weaves writing poetry, fiction, and non-fiction, with themes of grief and growth, into her busy family life. Bonnie A. McKeegan, LCSW is a private practice psychotherapist providing mental health treatment to adults, who also weaves writing poetry, fiction, and non-fiction, with themes of grief and growth, into her busy family life. She is currently writing Flight of a Change Agent: Memoir of a Social Worker. Bonnie A. McKeegan, LCSW is a private practice psychotherapist providing mental health treatment to adults, who also weaves writing poetry, fiction, and non-fiction, with themes of grief and growth, into her busy family life. She is a member of Sierra Writers in Nevada City, CA. She believes creative activities such as writing, art, gardening, handwork, and crafting can greatly enhance the healing process. She earned her BA in Social Work and Master of Social Work degrees from California State University, Sacramento. Her writing has varied in purpose and style from personal journaling, Grange newsletter and charter school parent handbook editing to her Master’s Thesis Project which focused on special issues women face when seeking substance abuse treatment. Bonnie is currently writing Flight of a Change Agent: Memoir of a Social Worker. Bonnie A. McKeegan, LCSW is a private practice psychotherapist providing mental health treatment to adults, who also weaves writing poetry, fiction, and memoir with themes of grief and growth, into her busy family life. She is a member of Sierra Writers in Grass Valley, CA. Bonnie believes creative activities such as writing, art, gardening, handwork, and crafting can greatly enhance the healing process. She earned her BA in Social Work and Master of Social Work degree from California State University, Sacramento. Bonnie’s personal and professional experiences with trauma, death, loss, codependency, infertility, and chronic illness have provided her with opportunities for deep spiritual, emotional, and mental growth. She also uses writing as a means to bring attention to social issues and memorialize family stories. 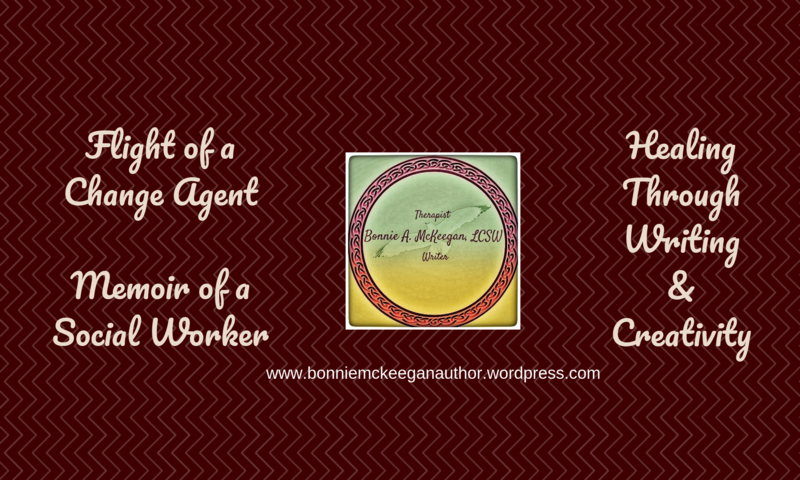 Bonnie is currently writing Flight of a Change Agent: Memoir of a Social Worker. Bonnie A. McKeegan, LCSW is a private practice psychotherapist providing mental health treatment to mature adults, who also weaves writing poetry, fiction, and non-fiction, with themes of grief and growth, into her busy family life. She is a member of Sierra Writers in Nevada City, CA. She believes creative activities such as writing, art, gardening, handwork, and crafting can greatly enhance the healing process. Bonnie earned her BA in Social Work and Master of Social Work degrees from California State University, Sacramento. Her writing has varied in purpose and style, from embellished personal journaling, Grange newsletter and charter school parent handbook editing, to her Master’s Thesis Project which focused on special issues women face when seeking substance abuse treatment. Bonnie’s personal and professional experiences with trauma, death, loss, codependency, infertility, and chronic illness have provided her with opportunities for deep spiritual, emotional, and mental growth. She also uses writing as a means to bring attention to social issues and memorialize family stories. Bonnie lives and works in Grass Valley, CA and enjoys creative writing, painting, yoga, nature walks, camping in state and national parks, snow skiing, reading, lake days, tending to the family pets, crocheting, and spending time with family and friends. Bonnie’s favorite relaxation spot is parked in a camp chair beside a fire at the ocean. Bonnie is currently writing Flight of a Change Agent: Memoir of a Social Worker. Bonnie is a Licensed Clinical Social Worker with a private psychotherapy practice in Grass Valley where she provides mental health treatment to mature adults. Bonnie earned her BA in Social Work and Master of Social Work degree from California State University, Sacramento in 1997 and 1998, respectively. Bonnie’s personal and professional experiences with trauma, death and loss, codependency, chronic illness, infertility, parenting of twins, and other life circumstances have provided her with opportunities for deep spiritual, emotional, and mental growth. She believes activities such as art, gardening, creative writing, handwork and crafting, yoga and other forms of mind, body, spirit practices can greatly enhance our physical, mental, emotional, and spiritual healing processes. She treats individuals from a holistic perspective, seeing them as whole beings, encompassing mind, body, and spirit. Bonnie has special interests in caregiver stress, death and dying, issues in mature adulthood, grief and growth, as well as compassion fatigue, vicarious trauma, and PTSD in first responders. Thank you for following my blog and a warm welcome to mine. Your work is inspiring and the belief that writing is one of the cornerstones within the healing process, couldn’t be more accurate. Reading your bio clearly reads you have a passion for encouraging others not to give up. Looking forward to reading more. Many blessings to you and be well. I am so glad my passion about not giving up comes through. It’s hard to know, when I write, if my message makes sense. Sometimes I don’t realize the messages in my writing until someone else reads it and tells me – love feedback. Thank you for visiting and following my blog as well!